This post comes from my experience as a non-professional, self-trained amateur/novice genealogist. I hope other "beginners" can benefit from these comments. One of the main problems I mentioned in an earlier blog post and am now finding (as I get way up my family tree to the ninth great-grandparent level) is determining which of the same-named people is my relative and whether that person is in the correct family tree spot if there is more than one similar name. Here is a good example to illustrate the problems with common, frequent use of the same name in generations "back then." 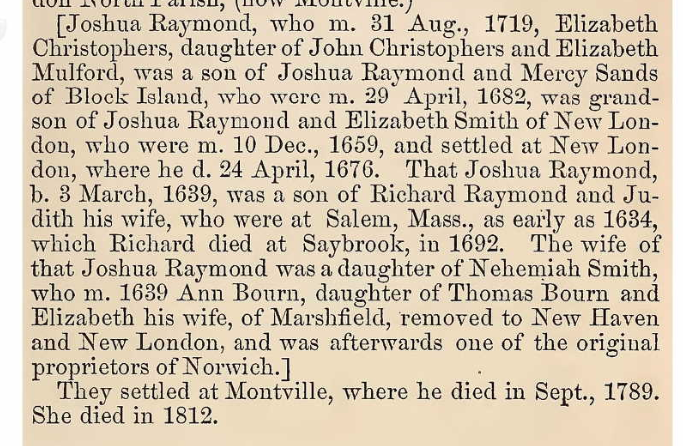 Joshua Raymond, who <married> 31 Aug. 1719, Elizabeth Christophers, daughter of John Christopher and Elizabeth Mulford, was a son of Joshua Raymond and Mercy Sands of Block Island, who were <married> 29 April, 1682 was grandson of Joshua Raymond and Elizabeth Smith of New London, who were <married> 10 Dec., 1659, and settled at New London, where he <died> 24 April 1676. The short paragraph continues to name more "Joshua Raymond's," none with middle names, several with spouses named "Elizabeth" and what I assume is accurate factual data about their birth, marriage, domicile, and death. This is not enough information for me to decide which name belongs in the 9th great-grandfather slot, if any of them do, and highlights the danger of just putting a name you might be looking for into your tree because an online database has an easy, familiar name without validating the person's specific relationship to you. In my case, one or all of these Joshua Raymonds are most likely related, but I cannot be sure where to put them in my genealogy based solely on this information; besides, the language in this paragraph and those before and after is very confusing, something that is common in very old documents. I will have to keep looking for validating clues...dates, names, places, some kind of 'newspaper' reports (though keep in mind the time period is mid- to late-1600's and early 1700's, when Massachusetts was known as Massachusetts Bay in British America), and other documentation. I must continue to challenge myself to be skeptical of similar names without removing much of the uncertainty; adding the wrong person can make the complex search algorithms used by the genealogical database owners take me down a rabbit hole that will only distract me from the already-complex enough journey up my own tree. Readers of this blog will remember that the challenge of finding and validating information as I make my climb up my family tree is part of the joy. It is also frustrating and infuriating, but it is always fun. Here is more fun I have had this past couple of weeks. I am a paid member at Ancestry.com's All-Access membership level, which includes everything Ancestry owns and has access in their massive database...all USA and world genealogical records as well as Fold3 military records, and the basic level access to Newspapers.com. The past couple of weeks have revealed so-far-unvalidated facts about my distant ancestors that have totally surprised me. The readers I mentioned earlier might recall my earliest memory of family history was of four immigrant grandparents, a memory that I have since proven to be false; instead of a strict immigrant background, I also have been amazed to find a long family history in southern New Hampshire and northern Massachusetts. This week has increased that amazement. As a reminder, my family comes from two main lines: Wilkinson and Burke. My paternal Wilkinson side were immigrants; that much is verified. Finding and validating information from them is very difficult because they hail from England...the records I have found so far are frustratingly slim. My maternal Burke side, on the other hand, is where the excitement and discovery are happening. Ancestry.com recently updated their system with significant improvements and access to the LDS Family History Library in Salt Lake City, the largest single repository of world genealogical data. In doing these upgrades, they have made more information available in a much easier to read format. That, in turn, makes finding, validating, and/or excluding clues to my past much easier. If the information I have found recently is validated - a process I take very seriously because of my background as an investigator - then my own Massachusetts ancestry now goes back to at least my eighth-great grandparents on my maternal great-grandmother's maiden side, Raymond. For those not familiar with genealogical references, that would be my great-great-great-great-great-great-great-great grandparents, WILLIAM RAYMOND, SR., and his wife, HANNAH BISHOP, from Beverly, Massachusetts. The farther back I go in time, the more rigorous I must be to ensure I am putting accurate information in my tree and not just pluck names out of a hat because they sound right; there are many similar names, both within a family and in neighbors, so care is required. I have a lot of work ahead of me, but so far, I have validated enough information to give me a high degree of confidence in my findings and I have to tell you this is about as exciting as I have been in a long time. Learning that my own family was involved in pre-Revolutionary War New England amazes and astounds me. In fact, back then, according to local probate records, Massachusetts was called "British America." I am so excited to keep my search going to find out just how far my roots spread. Am I related to someone on the Mayflower or one of the other ships that came to the New World early on? Which of my relatives was the first to arrive? Since their arrival in the 1600's, how and why did they come here? If they fought in our Revolutionary War, did they fight with the English "Redcoats" or for the British American revolutionaries? My journey up my family tree continues as the tree grows taller and fatter.